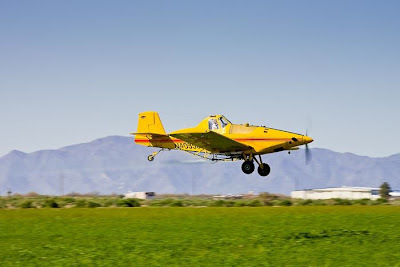 I was leaving an assignment in Chandler this morning when I saw this “crop duster” spraying a field next to the Intel plant, just south of the intersection of State Highways 101 and 202. Only five or six years ago this area was mostly agricultural with numerous dairy farms, cotton and alfalfa fields, and some sheep farms. There are still few fields, like this one, left, one dairy farm and one sheep farm but increasingly it’s commercial developments and some residential. Crop dusters working the fields around the Phoenix area used to be a common site. Now, not so much. In the future this will be an even less common scene. There are more photos of the crop duster in my PhotoShelter archive.